Loading controls are essential for proper interpretation of western blots. They are used to normalize the levels of protein detected by confirming that protein loading is the same across the gel. The expression levels of the loading control should not vary between the different sample lanes. Loading controls are usually proteins that exhibit high-level, constitutive expression in the cell type or sample you are examining. This ensures constant expression levels. Thus “housekeeping genes” are frequently chosen for use as loading controls. It is also important that the protein chosen as a loading control has a different molecular weight than the protein of interest so that the bands are distinct and expression levels quantifiable. Caution: Changes in cell-growth conditions and interactions with extracellular matrix components have been found to alter actin protein synthesis (Farmer et al., 1983; Ben Zeev and Amsterdam,1986). 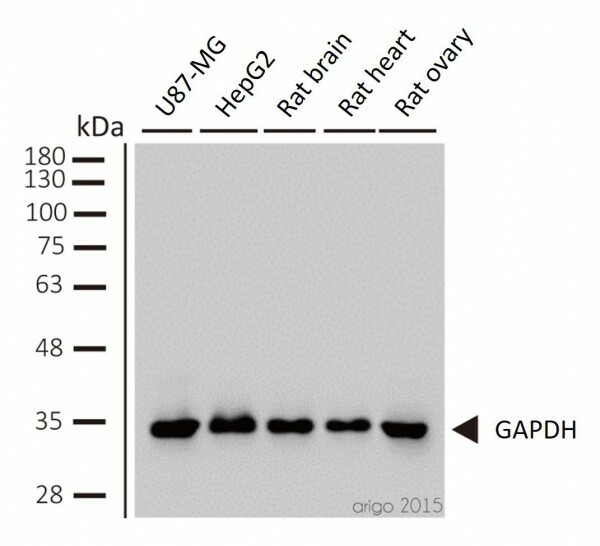 GAPDH is constitutively expressed in almost all tissues at high levels, therefore becoming the marker of choice as loading control in northern/western blots and protein normalization. Caution: Some physiological factors, such as hypoxia and diabetes as well as some sort of cancers increase GAPDH expression in certain cell types. Caution: Tubulin expression is known to vary according to resistance to antimicrobial and antimitotic drugs (Sangrajrang S. et al., 1998, Prasad V et al., 2000). VDAC is expressed at steady-state levels and thus makes a good loading control. COX-4 is expressed at consistently high levels and thus makes a good loading control. Caution: Many proteins run at the same 17 kD size as COX-4. The VDAC/Porin antibodies are good alternative mitochondrial loading controls for proteins of this size. Caution: Amounts of histone doubles prior to cell division! Not suitable for comparing S-phase with with pre-S-phase cells. Set of four primary antibodies (beta-Actin, beta-Tubulin, GAPDH, Histone H3) specific to proteins frequently used for protein normalization, plus one HRP conjugated secondary antibody. Sufficient quantity of each antibody is included for several mini-blots.